A new soda shop (or rather, a new branch of the soda shop I’ve been patronizing since I began writing these articles) just opened up quite near to me, which ideally means I’ll be reviewing sodas on a more regular basis henceforth. Paying the new shop my first visit over the weekend, I looked around for something I hadn’t tried before (happy as I would’ve been just to drink another Inca Kola), and hit upon this: a rose soda! A rose cream soda, to be exact. The proprietor suggested it tasted somewhat like bubblegum (shades of I.K. ), and I settled on it. I drank it immediately after and recorded my impressions as I did so; this review is compiled from them. 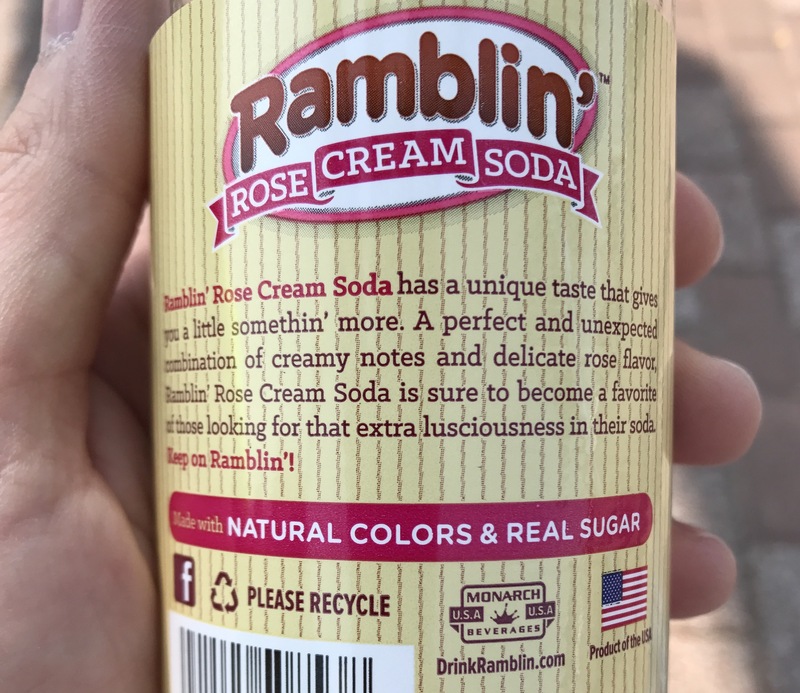 From Ramblin’ (a well-established brand, it would seem), Rose Cream Soda! A sweet, sort of sour-creamy scent, almost a tang to it. I’m not highly familiar with roses, maybe it smells reasonably like rose? Sweet. Very creamy (as befits the name). The bubblegum comparison was fairly accurate, though it’s not as sweet as bubblegum (or Inca Kola). Quite sweet, but not overpowering. Not as cloying as it could be. It can’t easily be compared to anything else, honestly. 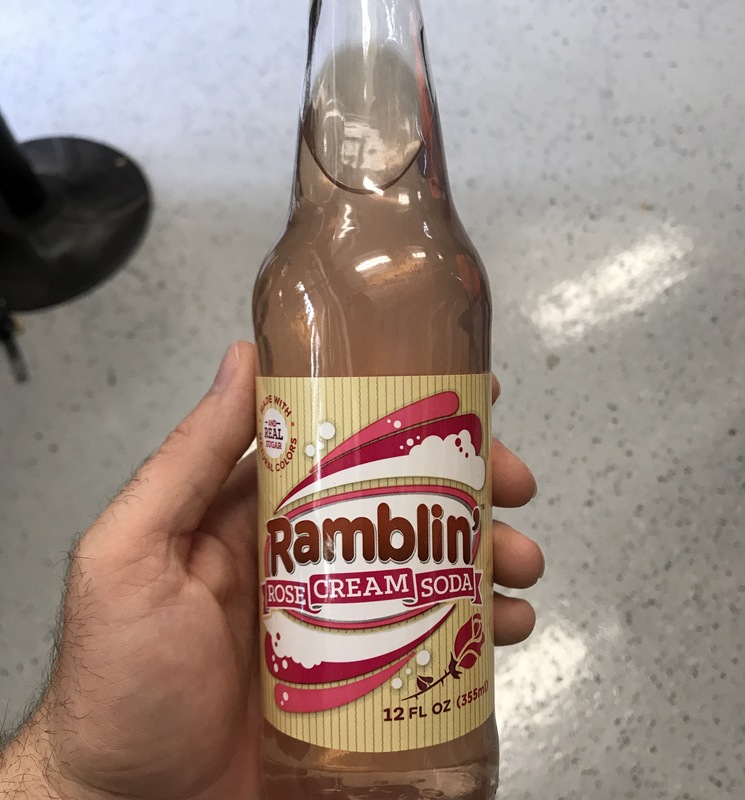 Other cream sodas, maybe? “A unique taste that gives you a little somethin’ more.” That’s not completely unfair. Maybe not “unexpected” for me, personally. High sugar content, by the way. 46 grams. Yet you don’t really taste it. It’s a pretty subtle sweetness. Again, not unpleasant. But it’s too bland for me to really love it. Are mixed sodas a thing? Like cocktails? Not like a “suicide”, where you just throw a bunch of sodas together in one cup, but a carefully measured and mixed combination of sodas? Would that work, though? The process would diminish the carbonation, wouldn’t it? This is a very strange drink. It’s not that I don’t like it, but I don’t love it. It’s quite singular, though. It’s about as good as a rose soda can be, I imagine. The rosy flavor could be overpowering, and it isn’t, so kudos for that. Finished. It’s one you can easily cross off your list, but I have a hard time imagining it’d be anyone’s favorite soda. That sounds more negative than I necessarily want to sound, but that’s where I’m at with this drink.